Since Mothers Day is coming up, I want to thank my uber-fantastic Mom for teaching me how to cook and giving me so many great memories in the kitchen. She used to bake bread EVERY DAY and I remember her giving me dough to create shapes with. She'd let me experiment without freaking out, she actually encouraged creativity in the kitchen no matter how messy (of course we'd always clean up afterward!). She even tolerated Dad trying to make homemade dehydrated cheese because Mac & Chese was so expensive (sorry, Dad, I had to mention it! :)). So, thanks Mom, I love you & hope my girls will have some of the same great memories. 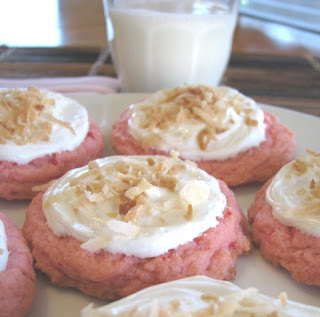 We're going crazy today, I made a video tutorial on these cookies! Woo hoo! (Not that they're hard, but just for fun:)). We're in charge of the "Z" snack tomorrow and this is what I came up with. Mix chocolate cake mix with 1/2 c. shortening, 2 eggs, and 2 T. flour. Set aside. In seperate bowl, mix white cake mix, 1/2 c. shortening, 2 eggs, and 2 T. flour. Let kids take pinches of different doughs and make a big mixed up pile of dough. Grab a piece of the mixed up dough and roll into a 6" snake. Shape into a "Z" s hape on a greased baking sheet. Bake at 350 degrees for 6-8 minutes. Enjoy! We've got a lot of eggs that need to be used and we also happen to have quite a few cookie cutters, so this was a great recipe find. The girls LOVED it! Quick and easy breakfast, works for me! Check out Rocks in My Dryer for all kinds of great tips. You can get the original from Family Fun here. We didn't use butter, just lightly sprayed the pan and it worked just fine. Crack the egg by striking it firmly against a bowl or ramekin, then carefully break open the shell. Pick out any shell fragments and set aside. Using a 3-inch cookie cutter (circle, heart, star or flower), cut a shape out of the piece of bread. Fry it lightly on one side (you can also fry the cutout shape). Flip the bread over. Reduce the heat to low. 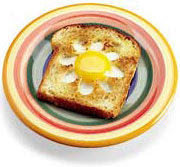 Ask your child to carefully pour the egg into the cutout hole in the middle of the bread. 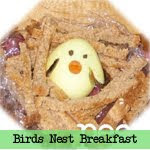 Cover and cook for 2 to 3 minutes or until the egg has set in the bread "nest." For an over-easy egg, he can flip the egg and bread and cook it on the other side. Serves 1. I saw the cutest things, edible jewels! What girl wouldn't love a jeweled tiara cake or what boy wouldn't go ga-ga over a jewel-filled pirate treasure chest??! These would make great cupcake toppers or a fun thank-you gift (give a bag full of them with a note saying, "You're a Gem!"). 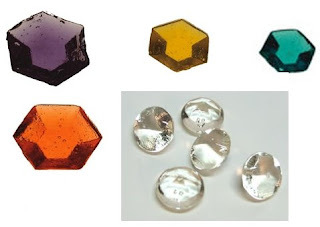 ...The only problem is that these little "gems" cost between $12-$26 for a pack of 80. Ack! So, I did a little hunting around and found out that you can buy a reusable hard candy jewel mold for $1.99 from Sugarcraft!! Go to http://www.sugarcraft.com/ and look for item #8H-5117. So, use this super-easy recipe for microwavable hard candy (below) and you have about 80 jewels for about 75 cents in ingredients. You can whip these little treats out in less than 10 minutes!! I bought two of the molds so I can easily whip up a large batch. The best part? They're reusable! SCORE! Don't get me wrong, I LOVE fancy flours, they have so many fantastic products and I highly recommend them. However, $1.99 for something I can use over and over again gets my vote. 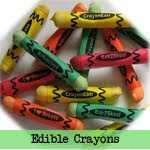 Food coloring, whatever color you want. 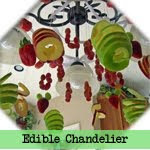 Lightly spray candy mold with cooking spray. Thoroughly mix sugar and light corn syrup in a 4-cup microwave-safe glass measure. Cover with plastic wrap. Microwave on HIGH for 3 minutes and 15 seconds. Remove from the microwave and carefully remove plastic wrap. Quickly stir the sugar mixture and then cover with a NEW sheet of plastic wrap. Microwave on high for 3 minutes and 15 seconds. Remove from microwave, carefully remove plastic wrap and stir with a clean spoon. After boiling has ceased, stir in coloring and then flavoring. Pour syrup quickly, but carefully onto prepared mold(s). Wait until cooled and they should pop out easily. You can repeat as often as desired. If you are only working with one mold and want to keep your extra syrup from setting up in the mixing bowl, place glass bowl in 300 degree oven while you are waiting to use it. Optional: If you want it a little sweeter, put in a dash of Splenda. Chop everything & put into a large bowl. Serve with chips. I've been inspired lately by a lot of things, good friends, good books, and life in general. These cupcakes are a tribute to two of the many wonderful things I've encountered lately: the people at "Hello, Cupcake!" and my Perky Purveyor of Everything Pink, Kristi. I just got "Hello, Cupcake!" in the mail, I think this is a must have for anyone with kids. The cupcakes are easy and whimsical, perfect for entertaining the kids and they can all help! Karen is a magician in the kitchen and Alan's photos are just plain gorgeous. The butterflies on these cupcakes are inspired by their Monarch Butterfly cupcakes, which are amazing. Kristi is a fabulous friend who recently sent me a whole box of ribbon in the mail! I made a bunch of hairbows to send with DH to Honduras (medical mission) and he said that they've been wonderful. I also love her blog and read it regularly. So, here's to you fabulous people, and to everyone who has made my life bright lately! My girls had a fantastic time decorating these cupcakes and can't wait to have them after dinner! Preheat oven to 350 degrees. Line cupake pans with liners. In a medium mixing bowl, mix cake mix, oil, buttermilk, eggs, and cherry pie filling. (If you want more pink color, add a drop or two of red food coloring). Fill cupcake liners 2/3 full and bake 12-18 minutes or until done. Cool completely. For the butterflies, melt white candy melts and put in plastic baggie. Snip the end. On a piece of wax paper, draw pairs of wings and candy cane shapes (for antennae). 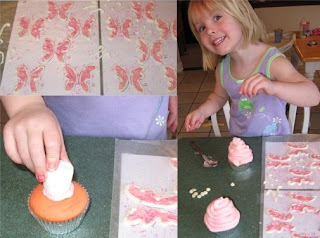 Melt the pink candy melts (or tint the white with a little red food coloring). Put in plastic baggie, snip the end, and fill in the wings. Sprinkle with edible glitter or sprinkles. Let dry completely. Place frosting in a gallon ziploc baggie and seal. Snip off a corner of the bag to pipe the icing. Take a large marshmallow and attach to the top of cupake with a dallop of frosting. Then, make circles around the cupcake with icing, starting at the base and working your way to the top. Decorate with chocoalte chips (put them "point downward" into the icing so they look like polka dots). Press a pair of butterfly wings into the side of the cupcake (you can pipe on a body also with white icing if you want) and add a pair of antennae. Watch these sweet butterflies fly off the plate! NOTES: I used the template from Hello, Cupcake for the wings, but for I don't think I should post it. I made another one from a coloring page that you can download here. Basic Buttercram Icing from Wilton can be found here. Happy Cooking! I stumbled on this really fun cupcake recipe made by Kevin Menzie, you can get step-by-step instructions and pictures on how to make these fun cupcakes here. Thanks, Kevin! The neck was made from two wafers fused together with chocolate. The head is a cookie, the ears are candy corn, and the mane is made out of chocolate licorice. Note: I would use cocolate frosting to pipe on some polka dots down the neck. Happy cooking! 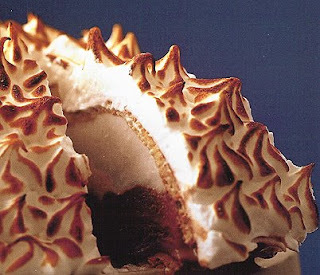 My husband and I have a favorite “manly and womanly” dessert, it’s the symbol of our marriage—Baked Alaska. If you thought Baked Alaska is a difficult dessert, think again! I love it because it’s classy and sooooo easy to make, especially with this cooked meringue recipe. Everything can be ready beforehand. You don’t have to whip up the meringue right before serving. It’s perfect for fun entertaining. DH loves it because I let him get out his giant blowtorch from the garage and torch the entire thing right before serving (insert manly grunts here). The crowd is definitely intrigued when he comes out with it to "get dessert ready". This recipe is fabulous because you can freeze the meringue before browning. A gorgeous dessert ready to go? Works for me! Check out Rocks in My Dryer for all kinds of other great tips! Soften ice cream and mold into a medium bowl about 9” or 10” diameter (I use a glass pyrex). Pour hot fudge over top and put into freezer. Make cake according to package directions in two 9” round pans. When cakes are cool, remove one of them and place on top of the hot fudge sauce. Return to freezer. The other cake is extra, you have dessert ready for dinner tonight! :) When cake in the freezer is solid, you can remove it and put it on a platter (or cardboard covered w/ aluminum foil). To remove, dip the bowl for a couple seconds in hot water and it should slide right out. You should have nice “dome shape” on your platter. Frost with Cooked Meringue (make sure to make some nice "peaks" to brown later) and return to freezer. Place in heated broiler oven (or get out the blowtorch!) and brown right before serving and enjoy! Over medium heat, dissolve sugar in karo. No need to boil, just make sure sugar is dissolved. In a medium mixing bowl, beat egg whites until fluffy. Add syrup slowly to egg whites, beating continuously. Whip till light, fluffy & glossy. Add vanilla. This meringue can be frozen before or after browning and thaws beautifully! Here's the recipe for these tempting little treats, you can get the original here. A tip on coconut oil, Don't buy hydrogenated coconut oil or oil that has been treated with solvents, bleach, or heat. Your best place to find it is probably at a health food store. 1. 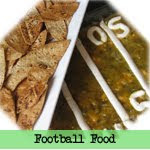 Preheat oven to 350 degrees F. In a large bowl, mix cake mix, oil and eggs until just combined. With a medium cookie scoop, scoop onto a silpat or parchment lined baking sheet. Do not press down. Bake for 11-15 minutes or until cooked through. Let cook 5 minutes before transferring to cooling rack. This is our family's favorite salad recipe. I have converted several "salad-haters" with it. One of my husband's colleagues who doesn't eat fruit OR lettuce gobbled it up and asked for seconds. I've tried it at dinner parties and all sorts of get-togethers and it's always a hit. If you don't have the recommended fruit on hand, just substitute whatever you have and enjoy! Mix all salad ingredients and toss with dressing just before serving. Mix all except oil and poppy seeds in blender. Blend on medium speed while slowly adding oil. Add poppy seeds and pulse a few times. Chill at least 2 hours or overnight. I love that sweet, thick teriyaki sauce you get at restaurants. This is our version and a family favorite. I like to roll chicken in corn starch, cook in a frying pan with a small amount of oil, ginger, etc., add veggies and this sauce. Yum! The kids love it. You can adjust the spices, honey, etc., to your taste. Mix all but cornstarch and the ¼ c. cold water in a sauce pan and begin heating. Mix cornstarch and cold water in a cup and dissolve. Add to sauce in pan. Heat until sauce bubbles and thickens (it's important to get the sauce to bubble so it boils out the "cornstarch" taste). You can add more water if it gets too thick. Serve with your favorite veggies and meats for an easy stir-fry! It's a great way to get my kids to eat tofu chunks, they gobble it up.